I recently learned how to make free and (almost free calls) to just about anywhere in the world using my cell phone. I’m not talking about Skype. Even though Skype has mobile apps, the calls are still expensive (especially if you call another mobile phone). A company called Rebtel. Using this company I’m saving 90% of what I used to spend on Skype, and the call quality is superb. 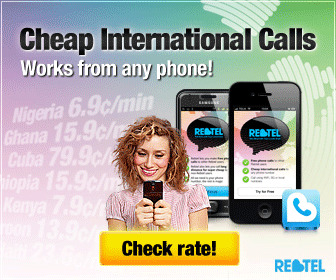 You can use Rebtel to call Singapore and it will cost you just a little more than it would if you were calling San Diego. Nice. 1. Super Easy. All I have to do is go on the site and input the names and numbers of the people I call all the time. The system then creates a local number for me to dial and connects me to my loved ones for dirt cheap. If I travel, I just get a local access number for free and the site gives me new local numbers to call my contacts. 2. Apps. Rebtel has apps for the Android and iPhone. This makes it even easier. But it works without a smart phone too. 3. Cheap and Cheaper. My kid can call me for 1.5 cents a minute from her cell to mine. If I call her, for some reason it’s 8.9 cents a minute, but that’s still cheaper than the 12.9 cents Skype was charging me. 4. I can call anybody even if they aren’t signed up with Rebtel. 5. There is also a way to call international cell phones for free. 6. The best part: I can even use this service while I travel. When I travel, the website automatically gives me a local number depending on where I am. In other words, if I am in India, Rebtel gives me a local Indian number to dial if I want to reach my wife’s cell in Los Angeles. If I then go to Vietnam, Rebtel will give me a different number. It will be a local number to dial from Vietnam but I still reach Mrs. Pilgrim in Los Angeles. I love it. I looked far and wide for something to complain about, and I found it. Calls are rounded to the minute for the first minute, and thereafter they are rounded every six seconds. A small price to pay but OK…if you want to complain…there you go. You can set up a Rebtel account for free and they’ll pay for your first call. I tried it and loved it, so I deposited $25 with them about a month ago. I still have $15 and change on account. Just to give you an idea, we used to spend over $75 a month on Skype. You can see why this Pilgrim is so jazzed up about this service. Give them a try, but don’t thank me. I’m just doing my job. Cool service. Thanks for sharing this. I’ve been scouring the web for Skype alternative and this is the first time I hear about RebTel. Very cool service! I will keep this in mind. I get one of my friends or family asking me about cheap ways to call people using VoIP about once per year, so this will come in handy! I’m not sure..maybe you can ask them on the help desk? Does anybody know if I have to buy credit before I place my firt phone call? I was wondering if this is the reason why I have tried to use Rebtel to call my family in Brazil for years (since 2007)and it never worked for me. I don’t know if I can get this in Canada. I currently use Yak at a rate of 3.5c a minute. Yes, I was wondering how to save my cell phone bill. Let me know how it works out. I think you’ll love it. This is exactly what I need. Thanks for posting it. I have tracfone and they have a program where I can call international and just pay local rates. I have to call their server and then connect, but I got busy when I dial international the last few times I tried! I’ll try out Rebtel.